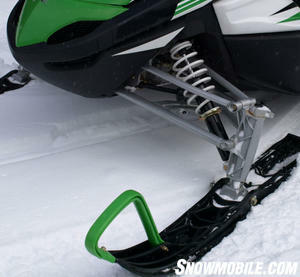 Arctic Cat’s understanding of two-up snowmobiling dates to the mid-1960s when Cat engineers devised the first full production parallel rail slide suspension for its Panther. 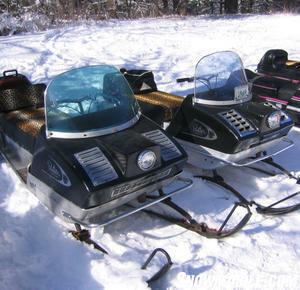 Since then Arctic Cat has continued to build on its reputation as the maker of the ‘Catillacs’ of touring sleds. Check out the turbocharged power of the latest two-up Cat, the TZ1 Turbo Touring LXR. This take-a-friend along model has the character of a sport sled with all the amenities of a luxury SUV, including a heated seat! While the more basic T500 touring model may not be as fully featured as the top of the line TZ1, it offers quite a lot for its US$8,499.00 base price. Just as the 1966 Arctic Cat Panther promised the best ride for the day, the 2009 Arctic Cat T500 offers superb ride characteristics as well. Its slide-action rear suspension is essentially the same unit found in the top line TZ1 Turbo Touring. It has the coupling blocks to keep the skis planted on the snow for precision turning, the fiberglass overload springing to accommodate two-up and solo riding needs, hydraulic twin-tube front arm shock and the Torque Sensing Link rear arm to complement ride control. Expect more than a foot of useable suspension travel, 13.3-inches to be exact. Arctic Cat pioneered double A-arms and is in its seventh generation on the T500. The 2009 T500 features Cat’s pioneering and seventh generation double wishbone AWS VII front suspension. The T500’s hydraulic shocks are a bit less sophisticated than the gas shocks found on the more expensive touring versions, but they should prove adequate for long rides on groomed trails. This is easily upgraded if you find the shocks are not to your liking. The shocks control 9.5-inches of suspension travel. We found this more base touring Cat to be good riding and incredibly precise on the trails. That owes to the revised rear suspension and good front suspension geometry, which includes a sway bar to control side to side action and good bite on the UHWM plastic saddleless skis. When you opt for the smallish 499cc liquid-cooled twin, you get an engine designed to lay down into the motor bay of the Twin Spar chassis. This placement allows centralizing the mass of the powertrain to provide an exceptional low center of gravity that further enhances overall on-trail stability and handling. In addition, the Twin Spar design brings rider-forward seating to T500 riders. This design moves the rider nearly a foot more forward than previous Cat designs. The seat is taller and you can feel a more relaxed, in-control handlebar position. This makes a comfort difference for the rear rider. The T500 combines the latest Twin Spar design with reliable performance. You’ll note how the passenger moves forward of the rear idler wheels and more over the suspension’s rear swing arm. This is a good thing as the rider sits in the T500’s ‘comfort’ zone. Think of when you were a kid riding a school bus. You may have liked to sit in the back over the rear dual wheels because you liked the jouncing on back roads. If you sat ahead of the axle, the ride was smoother, less bumpy — less fun? Well, when it comes to being a passenger on a touring sled, less bumpy is more fun. Being ahead of the rear axle and its idler wheels generally means a smoother ride. The T500 passenger gets the better ride location. Designed to lie down in the chassis, the Suzuki-built twin features Arctic Cat pioneered batteryless fuel injection. The T500 comes with electric start and reverse as standard fare. But, if you had to pull on the starter cord, the engine should turn over easily and start within a couple of pulls. This motor is a proven design and should be nearly bulletproof in its modest 85-hp stage. Some earlier versions of this twin put out more than 100-hp in some Firecat editions. So we would expect this modest powerplant should be both spirited and extremely reliable. To further enhance the T500’s capabilities for ‘take-along’ duties, Cat engineers fit the sled with its Arctic rpm-sensing drive clutch and roller cam secondary. You can expect the drivetrtain to transition easily from takeoff to full throttle wind on the straights. Backshifts are smooth as the drivetrain is tuned specifically for the needs of a two-up touring machine. You’ll have a 15-inch wide by 144-inch long track with one-inch lug profile to grip the snow. This track suits the needs for trail riders and its pattern is designed to minimize noise while still providing ample traction. Simply remove the detachable passenger pillion and you’re ready to go solo. Should you prefer a little solitude, you’ll appreciate the T500’s standard detachable passenger seat. 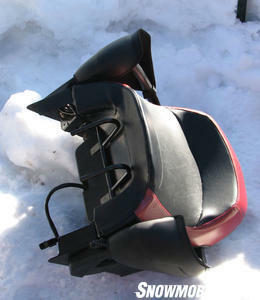 Adjust the backrest, remove the two-up’s passenger seat section and you have a versatile long tracked sport sled. Well, sort of, we don’t recall too many sport sleds with the rider protection afforded the T500. This sled has a very effective tall, wide and actually handsome windshield. Arctic Cat test riders must have had some strong input into this design. Imagine test riding in the concrete-like ditches around Cat’s Thief River Falls home base when the brutal northern Minnesota winter cold dips to minus 30 degrees. Even hardy Cat test riders will want some wind protection. The T500 windshield gives it. The T500 also provides other goodies, like push button reverse, an electric gas gauge, and a cargo rack. Although this sled does not come standard with rearview mirrors, you can add them as optional equipment. You can also fit a complement of touring bags and gear to the T500. But you don’t have to fit hooked handlebars as the T500, like other Cats, comes with the niftiest bar set in the business. This is another thing that Arctic Cat engineering has down. 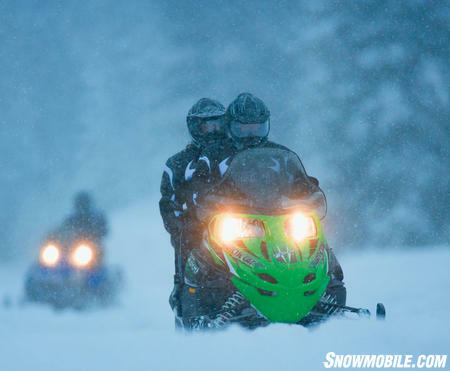 They fully understand on-trail ‘feel’ and just how much it impacts a snowmobiler’s experience. You can see, even on this ‘value’ touring sled that Arctic Cat engineering gets it. After all, they’ve been getting it and passing it along since the mid-1960s.